Yep time for us to share another one of our creative ladies at The Latte Lounge with the world. This week the lovely Marie Bridgeman has agreed to be featured. Short biography - My name is Marie and I live in London, England with my wonderful 9 year old son, Sam and our fur baby, Tippy who is a chorkie (a cross between a Chihuahua and a Yorkshire terrier). How long have you been paper crafting?/How did you get started in paper crafting? I started crafting in 2007, after ill health meant that I had to give up my busy job at an advertising agency and I was spending alot more time at home than ever before. I was getting bored of spending night after night in front of the TV and so decided that I needed to find myself a hobby. I‘m not entirely sure what gave me the idea, but I bought a small kit and tried cardmaking, absolutely LOVED it and the rest, as they say, is history!! My house has now been taken over by stash and my clothes addiction has been replaced by a paper one! What crafting item can you not live without? My paper trimmer!! It’s a real basic but I use it on absolutely every card that I make! What is your favorite paper crafting company? That’s a hard one – there are so many!! Basic Grey, Cosmo Cricket, Imaginisce, American Crafts to name but a few!! What is your favorite coloring medium? I mainly use promarkers because I find them the quickest to get good results but I also really love prismacolour pencils blended with sansodor and watercolouring with distress inks. Do you have any other hobbies? I’ve got a bit of a (sad) addiction to American TV shows, I love watching films – both at home and going to the cinema and I’ve always enjoyed reading. Is there anything else you would like to share about yourself? I’ve got a really cool tattoo on my right foot (pictures available on request!) Nah, seriously though – I love cardmaking and because of that, blogging has also become a big part of my life and I’m so grateful for the people who come and visit my blog and leave me such wonderful comments and the friends that I have made throughout the world. I had reached a time in my life where, because of illness, I had a complete change of lifestyle and it could’ve become quite a dark time but instead because of this wonderful hobby, I’ve always got something to do, someone to talk to and life’s always that bit brighter! Please come and visit me at my blog – www.cardmakingbird.blogspot.com I always like to make new friends! Also don't forget our Christmas Celebration at TLL this coming weekend. There will be challenges, games, prizes and fun. We'll be setting up a time to chat but feel free to do so any time since the chat window will be open all weekend!! PCP Digi Day in The Stamping Boutique group from 3-5 PM. We will be having a special guest -- Fresh Brewed Designs. Lots of fun to be had this weekend!! It's time for a Digi Paper Challenge #2 - Candy Cane at The Latte Lounge. You'll receive one of the digi papers from my Candy Cane paper pack for free. You use that digi paper or one from your stash to make a project. Post the project to the challenge thread for an entry to win BOTH the paper pack AND two images from The Stamping Boutique. The theme for this challenge is Candy Cane - red and white. 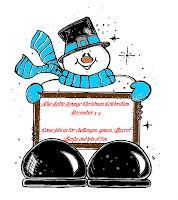 The challenge is open until Dec. 12th and the winner will be announced on the 13th. My first card uses Candy Land Winter Cake from The Stamping Boutique. I colored the image using Copics and tried out my new Martha Stewart punch. I've never punched anything before. This card would also be perfect for Rhonda's Die Cuts or Punches Challenge. This card uses Candy Cane Callie and Candy Cane Bunny from JLJ Designs. I used a tutorial for a Diagonal Double Pocket Card. In order to make this card, I taped two pieces of printed paper together, but you could just as easily print on both sides. I colored the images using Copics. The bunny tag will be used to write a holiday message. I'll put a gift card in the middle pocket. This card features the tree from Stacie's Wacky Wednesday Challenge. 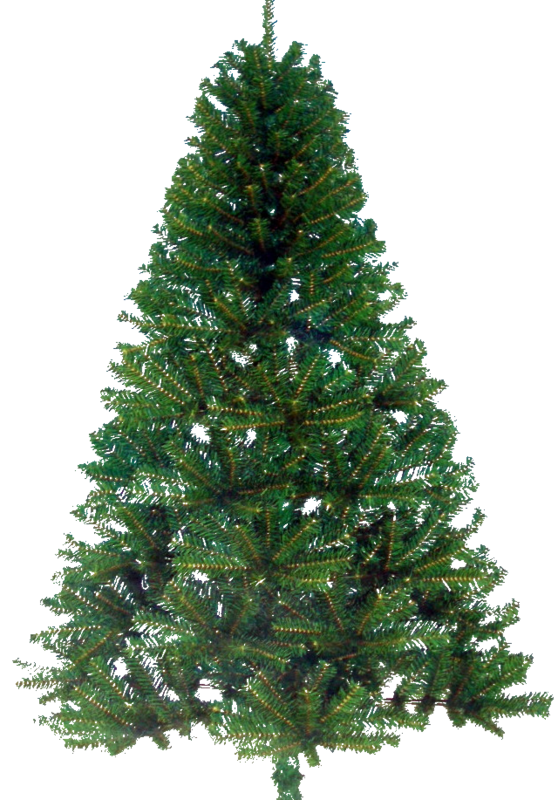 I used the Candy Cane digi paper to trim the tree! The other papers are from my Traditional Christmas paper pack. Hope to see you at The Latte Lounge this week! Don't forget our Christmas Celebration next weekend! Also be sure to stop by early and join the fun of our Secret Santa group!!!! You don't want to be left off Santa's list. I hope you'll all join us. 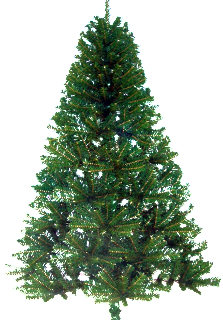 Wacky Wednesday Challenge #3: Trim My Tree! seemed a little too tough, eh? but the ones we DID get were AWESOME! Thank you for playing with us at the Wacky Wednesday Challenge! Print it any size you like. Post it at the Latte Lounge! I hope you'll have fun with this one! Welcome to another Featured Member post here at TLL!!! This week we are featuring the wonderfully talented DQ aka Denise!!!!!!!!!!!!!!!!! Hi, my name is Denise, or DQ for short. I am a mother of 2, one 19 year old boy and a 10 year old girl. I'm a Cross Stitcher at heart but I enjoy all crafts. For the past year and a half, cardmaking has become my passion! That would have to be paper, paper, paper, any and all kinds of paper. Must admit, I don't have one favorite, I have several, they are Basic Grey, K&Co, DCWV, just to name a few! I would have to say Copic Markers right now but Prismacolor pencils run a close 2nd. Here are some of Denise's beautiful works!! Be sure to stop by DQ's beautiful blog and leave her some love!! As always, we are grateful you stopped by today!! We're mid-way through the Hidden Element Challenge. I have two new cards to share with you. The first is a window card featuring images from Some Odd Girl. I cut a window to give a glimpse at the hidden image and sewed tulle into a ribbon to make the curtain. This card features a hidden tag sentiment. I made a little pocket on the front and put the sentiment inside. We have a lot of great challenges going on and fun coming up at The Latte Lounge. The Christmas Celebration is coming up Dec. 3-5. Don't forget to sign up for the Secret Santa. You still have a few days to enter Stacie's Wacky Wednesday Challenge - Show me the Money. Rhonda has a new challenge to use die cuts or punches. Are you ready for another new challenge at TLL? For this challenge I'm asking you to use die cuts or punches on your creations. The challenge will run for 2 weeks and will end on Dec. 2. I used Audrey and Santa from The Stamping Boutique for this one and my Top Note die. For this one I used this Merry and Bright image from Deedee's Digis. I used a border punch on the red strip and my corner rounder for the scallop oval. I hope you'll all play along with us. P.S. Don't forget about our Christmas Celebration coming up December 3-5. Jennifer is hosting a hidden element challenge that will run until November 28. Stacie's current Wacky Wednesday challenge is Show Me the Money and runs through November 24. Today we are introducing you to CHERYL GORKA!!! I just love her style so let's get to know her a bit better!!! Hello! I’m Cheryl Gorka. I’ll try to make this interesting but I live a very normal life. You might want to grab another cup of coffee before reading. My husband and I have known each other for years and will have been married for 12 years in November. Our daughter will turn 9 also in November. Two dogs (a lab/golden mix & a cocker spaniel) and a Senegal parrot round out our family. I work full time for an electronics distributor in the Fortune 250. My job is filled with spread sheets, numbers and conference calls. I am lucky enough to be able to telecommute from home and only have to go into the office or travel for special meetings. Working from home has its ups and downs, but you can’t beat the commute! I work flex hours so that I can maximize the time spent with my family. When I am not paper crafting, I love reading and listening to music. I always have music on. I love all types of music from pop, rock, alternative, alt-country, blues, rockabilly, you name it. I jazzercise 2-3 times a week to try to stay in shape. It is the only work out program that keeps me from getting bored after a few months. You will find me on other crafting, music and book networks as “elizgmom”. 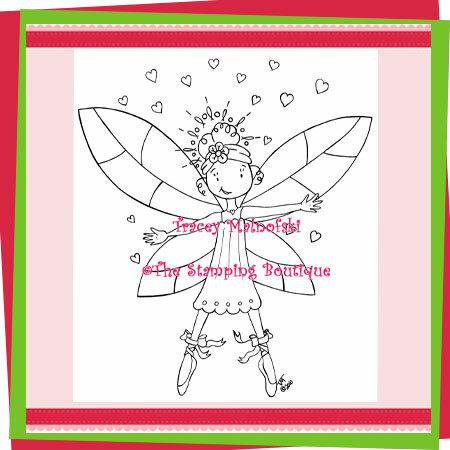 My paper crafting blog is She Stamps. I would say on and off again for about 5 years. I really started getting more involved over the past 12-14 months. I started paper crafting by going to a neighbor’s Creative Memories party. I thought it was neat and bought a few things. I had a friend in the neighborhood who liked to scrap book so we would get together to let our daughters play while we put some pages together. Another friend brought me to a Stampin’ Up workshop and I found I loved making cards. I would look forward to the workshop and an evening with my friends every month. The demo’s life got busy so she stopped having regular workshops. I looked around for another demo in my area but couldn’t find anyone whose style I clicked with. About that time (a little over a year ago), some one left a comment on a card I had posted on Splitcoast Stampers that I should enter my card in their challenge. That one comment opened up an entire new world for me. I found blogging and challenges, and started developing my own style. Then I found digital stamps and I haven’t looked back since. Just one? Oh boy, I think my ATG tape gun. I used other types of adhesive in the past and my projects would sometimes fall apart. I have never had that problem with ATG tape. This is another hard one. There are so many fabulous companies out there and I love so many of the products right now. If I have to pick one, I would say October Afternoon. I love their paper. I am terrible – I save the smallest little scraps just in case I can use them to paper piece something later. Copic markers! I really just started using them over the last few months but they are now my “go to” coloring medium. I am in awe of how well some people can color with them. Not really. My family and friends, paper crafting, and work take up most of my time. I fill any other free time reading. I am really honored to be chosen as a Featured Member. Thank you for letting me share a little bit about myself. Here are some of Cheryl's beautiful projects!!! As always, we are grateful you stopped by!! 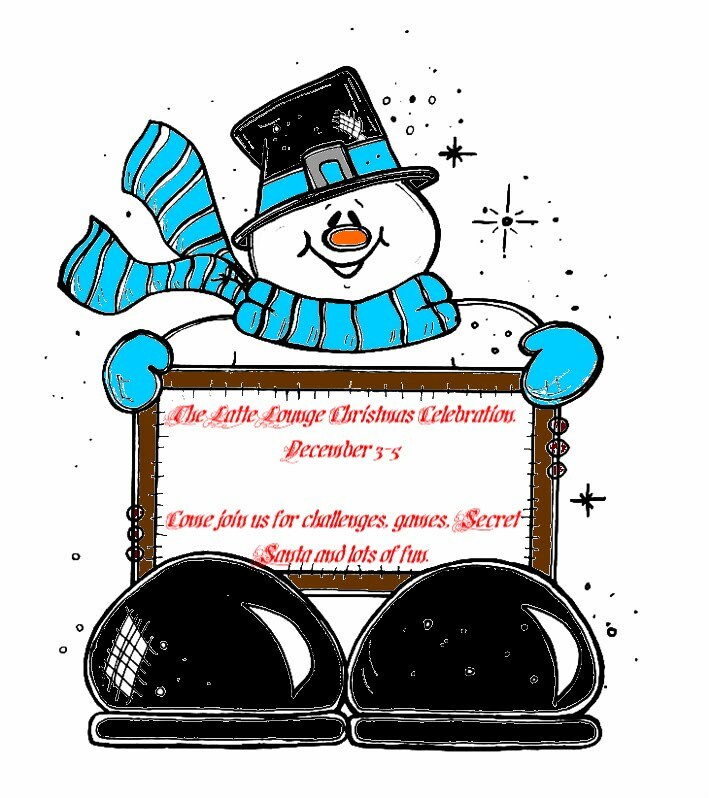 Have you heard about the Christmas celebration Dec. 3-5 at The Latte Lounge? Rhonda will be hosting a fun filled time. Stop by now to sign up for Secret Santa. I want to say congrats to Maria for winning my digi paper challenge. I'll have another digi paper challenge for you in two weeks. My new challenge starts today at The Latte Lounge. For the next two weeks, I'm sponsoring aHidden Element challenge. Your card should have a hidden element - tag that slides out, something that flips open. DH has been wanting me to make a lift-the-flap card similar to Peanut's books. So, I gave it my best shot. My first card uses the Matroyshka Dolls from The Stamping Boutique. My sister colored most of the dolls. I cut them out leaving a tab at the top and then glued two of the same size doll together. I cut out a slightly smaller hole in my paper underneath the doll. I then glued the tab to the underside of the paper and constructed the card in layers. The bottom doll is still glued to the front of the card. For my second card, I used JLJ Designs (aka me) Beary Merry Christmas Dreams and Beary Merry Christmas Morning. I used the same technique of leaving a little flap, this time on the side of the image. For this card, I actually cut a hole in the card and the paper that I used to cover the front. I stuck the tab between the paper and the card. The second image is mounted inside the card. I added a string of beads and red roses. You have a few more days to enter Rhonda's Thanksgiving challenge. Stacie has challenged us to use real money on our cards. She's got a great one with a hidden bill, which would qualify for both our challenges! I hope to see you at the Hidden Element challenge at The Latte Lounge. Hello all!!! Today is all about our members. The following projects were recently posted in our gallery. I hope you'll stop by and see all the beautiful works. While you're there, why don't you post a few of your owns?? Show Me the Money - Due November 24th. Time for a new "Wacky Wednesday" Challenge!! Last week, there were FIVE awesome entries in the Wacky Wednesday Challenge, Use Real Wood. Because it is impossible to pick my favorite, I used Random.org. The winning entry was submitted by Brenda Burfreind. Now, it's time for a new "Wacky" Challenge! This one is for all the Jerry McGuire Movie fans! USE REAL MONEY IN OR ON YOUR PROJECT!! When you pull the sides, it slides open to reveal it's secret compartment! Can't wait to see all your Wacky creations!!! C'mon over to the Latte Lounge and play with us!! We're half-way through Digi Paper Challenge #1 at The Latte Lounge. For this challenge, you receive one of the digi papers from a pack for free. You can use it or a digi paper from your stash to create a project. This week the theme is Thanksgiving colors. The winner of the challenge will receive the whole paper pack and two images from The Stamping Boutique. The challenge ends on Nov. 14th and the winner will be announced on the 15th. I have two new cards for your inspiration. 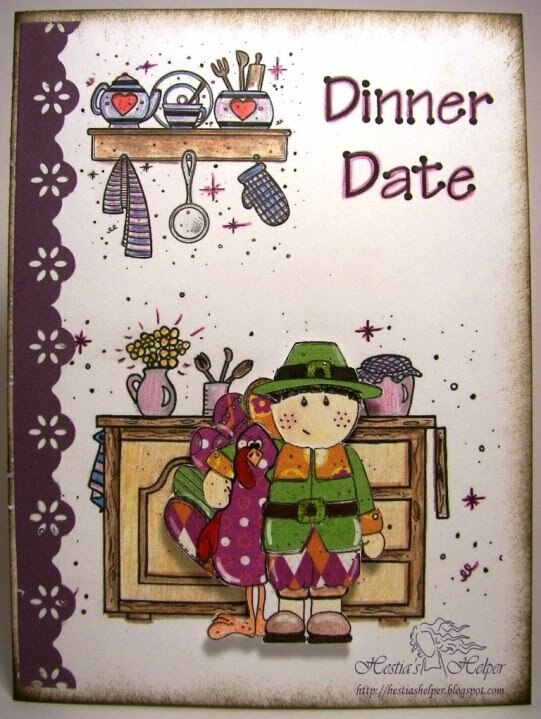 This card features AJ the Pilgrim from The Stamping Boutique. All of the papers are from the Thanksgiving Paper Pack. I added some sentiments I printed out and Prima flowers. My second card features my Sugarplum Fairy Bear. I wanted to make a card using theThanksgiving Paper Pack that wasn't for fall. Stacie's Wacky Wednesday challenge closes in a couple days, but there's still time to enter! Rhonda has a Thanksgiving challenge - you could have two entries with one card with the digi paper challenge! Hi everyone!! Welcome to another challenge at The Latte Lounge. For this two week challenge I am asking you to create something for Thanksgiving. It can be anything from cards to decorations, whatever you would like to create. The challenge will run for 2 weeks, so you will have until Nov. 18 to enter. The image is from The Stamping Boutique. I colored it with Marvy markers. The DP is from JLJ Designs. The Sentiment was computer generated. The image is from Dustin Pike. I colored it with BIC Markits. The Sentiment is from TLC Creations. The DP is Me and My Big Ideas. I'm not sure I like how this one turned out, but here it is anyway. I hope you'll all play along. Be watching for a fun announcement. Stacie has her Wacky Wednesday Challenge running until Nov. 9. Just use real wood in your creation. Jennifer is having her Digi Paper Challenge that runs through Nov. 14. She has offered a freebie to use on your creation. There's still time to submit your "Wacky Wood" Project!! Look how cute this turned out!!! Jen, at JLJ Designs submitted this adorable creation for the "Wacky Wednesday" Challenge and I LOVE it!!! And the inside is AWESOME too! She has been creating a set of gift card holders and it's a really neat technique! but there's one week to go! C'mon, give it a try... it's actually kinda fun to do something that doesn't include the same old stuff, isn't it? NEW DT MEMBERS HAVE JOINED US!!!!! I'd like to welcome our 2 new Design Team members to The Latte Lounge. Current Challenge - use real wood on your project. Be sure to stop by and check it out however don't go when you are hungry!! Her sample is VERY tempting!!!! Jennifer - her blog is JLJ Designs. Current Challenge - Digi Paper. Jennifer has even given us a free sample of her fabulous Thanksgiving digi paper to use!!! Both have already started and are offering some fun challenges. These ladies have been very active at TLL and help to make it such a wonderful place to hang out!!! I hope you'll leave them a welcome here in the comments!! Have a fabolous day!! Welcome to my first challenge at The Latte Lounge. I'm so excited to be hosting the challenge! My first challenge I call the Digi Paper Challenge #1. You'll receive one of the digi papers from a paper pack for free. You use that digi paper or one from your stash to make a project. Post the project to the challenge thread for an entry to win both the paper pack and two images from The Stamping Boutique. This week, I have a Thanksgiving paper pack. On the challenge thread, there is a link to download the freebie. 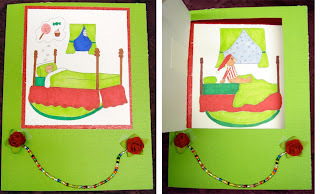 Stacie's wonderful paper pieced card uses all of the papers from the paper pack! 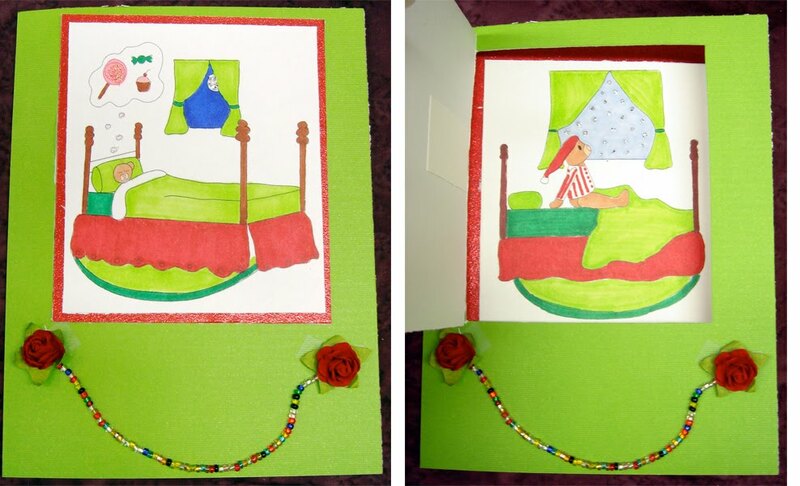 Rhonda's sweet card demonstrates that these papers aren't just for Thanksgiving! Here's my card. 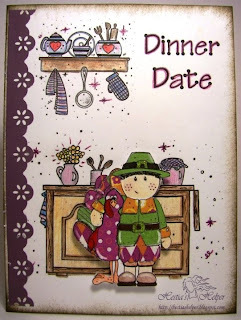 I used The Stamping Boutique's Audrey the Pilgrim. I wanted to use an interesting quote for the card and I found this one from Carl Sagan: "If you wish to make an apple pie truly from scratch you must first invent the universe." Please join us at the first TLL Digi Paper Challenge! The challenge will be open until November 14th and a winner will be announced November 15th. Rhonda is sponsoring a Colors of Fall challenge until November 4th. Stacie is sponsoring her first Wacky Wednesday challenge - using real wood somewhere on your project - until November 10th.